Storms have already caused a record-setting amount of property and crop damage this year in Kansas, state regulators have announced, with high winds, hail and tornadoes inflicting more than $1 billion in estimated insured losses. 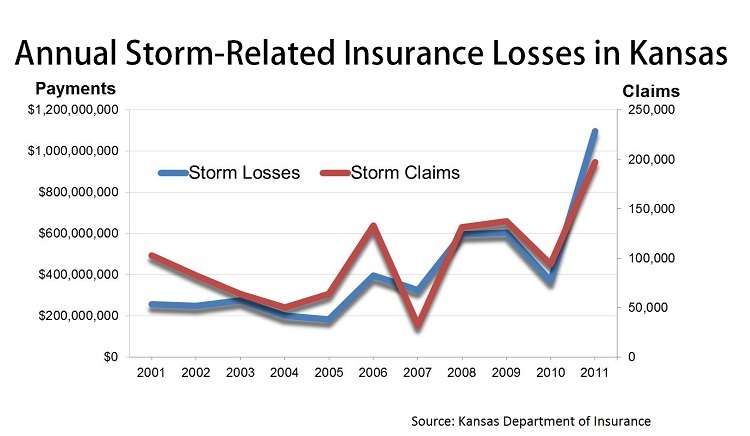 “It’s been a tough storm year for Kansans and for the companies that insure them,” state Insurance Commissioner Sandy Praeger said in a news release. The estimated damage to homes, automobiles, other property and agriculture are based on roughly 197,000 insurance claims filed with the state’s insurers. The losses exceed by $300 million the previous record, set in 1992, of $700 million on 365,500 claims. “And we still have the rest of 2011 to go,” Praeger said. More than half the damage was done in April, when residents filed 66,000 claims for $502.5 million in losses after hail and wind storms hit the state, Praeger’s department reported. Property damage in June added another $202 million on 43,000 claims, with wind and hail again to blame. Crop damages for the year to date were estimated at $18 million. Praeger said the higher claims totals are attributable at least in part to increasing costs for material and labor. She said record-setting damages could lead insurers to increase rates in the state or in particularly hard-hit regions. That may mean higher premiums for Kansas residents looking for coverage that provides instant proof of auto insurance. The insured losses were not quantified by the types of property damaged, but department spokesman Bob Hanson confirmed that they included damage to residences, automobiles and other property. The damage estimates include storm-related losses reported by the state’s private insurers but do not include losses from flooding or “other insured perils,” according to the department.